In the movie City Slickers, there is a scene where a tough old cowboy, Curly (played by the late Jack Palance), espouses his life philosophy to Mitch (Billy Crystal). Curly: One thing. Just one thing. You stick to that and the rest don’t mean *#*!*#!. Curly: (smiles) That’s what you have to find out. For Mitch, the one thing turned out to be his wife and family, which are certainly important. But the Bible reveals one thing that matters more than even marriage and family, and that is knowing Jesus Christ as Lord and Savior. In Matthew 6, Jesus warned his followers of the temptations, treasures, and worries of life that can distract us from the one thing that will decide our entire eternity! Gently and with compassion He tells us to “Seek first the kingdom of God and His righteousness, and all these things will be added to you.” Find Me, He was saying, and I will give you far beyond what you can ask or imagine! David said; “One thing have I asked of the LORD, that will I seek after; that I may dwell in the house of the LORD all the days of my life, to gaze upon the beauty of the LORD and to inquire in His temple” (Psalm 27:4). 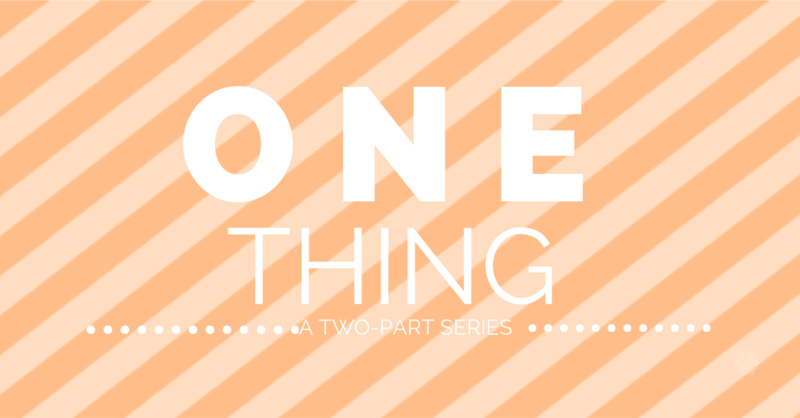 So what is your one thing? Before you answer, it would be helpful to consider what most occupies your thoughts and time. What gets you out of bed in the morning? I have sat with many women who feel close to despair in their circumstances. Yet when I ask them about their relationship with God, all too often they admit a lack of time in His Word due to the many other things that fill up their lives. Many know things about God but don’t have a deeply intimate relationship with Him. The truth is; we all make time for what really matters to us and, according to Psalm 115:1-8, we will become what we worship and what we put our trust in. Those who make them will be like them and so will all who trust in them. While we don’t typically cast idols of gold and silver today, there are functional idols in our life just the same. Tara Barthel and Judy Dabler say: “We make minute by minute choices to worship either the one true God or false Gods. In our fallenness we often try to find peace by going after things like financial security, professional success, educational achievements, and people (the “perfect husband, friend, parent, child, etc.”). If God reveals a few idols from this exercise, don’t be alarmed – we all have many vying for our affection at any given time. At the same time, the proper response is to confess and repent, asking for God’s forgiveness and help; that you might make Him the one thing you desire above all other lesser things. Amen! The Lord alone is worthy of my devotion and to always be my first love. Wonderful post, Linda. “One thing” can sound so simple, but it’s amazing how focus on the right “one thing” – the Lordship and love of Christ, displayed in the power of the Gospel, makes everything else fall into place and assume right priority. Thank you for the continued blessing of your godly wisdom and teaching. Thank you Linda. Indeed, our hearts are prone to wander. Praise God for sending His Son Jesus Christ to set us free so that we are able now to choose Him!